Get a great start on your Golf Trail Getaway at family-owned Holiday Shores Resort, featuring 26 cottages overlooking the Lake of the Ozarks. Holiday Shores' central location ensures an easy drive to all of the 13 fun courses on the Lake of the Ozarks Golf Trail. Resort staff will make all your golf arrangements at courses you choose, for a money-saving stay-and-play price. 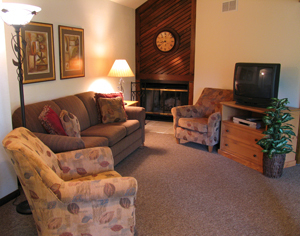 All you have to do is relax, enjoy the resort's home-like accommodations and scenic setting -- and play some great golf! 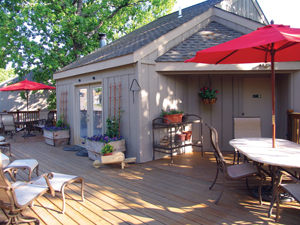 Holiday Shores features 26 individual three-bedroom cottages with large, fully-furnished kitchens; two private decks with a gas grill; WiFi; cable TV and DVD/VCR and wood burning and/or gas fireplaces. We also have covered electric boat slips, a private boat launch, game room, fire pit area, a heated pool and a large playground for the kids to enjoy. At Holiday Shores, you're just minutes away from award-winning restaurants and plenty of night-time fun when the day's golf is done. Wineries, caves, state parks, shopping, museums, scenic drives and more -- they're all close-at-hand for golfers and their families. For your next golf getaway, make you destination a place that's just like home, only better! That's Holiday Shores. Fully furnished cottages with lake access. Full kitchens, washer/dryers, gas grills, cable, internet and fireplaces. Resort has on site boat rentals, private boat launch and fully electric, covered boat slips. 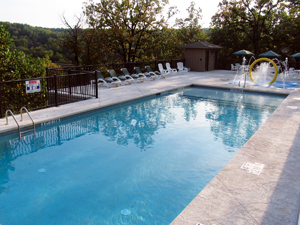 Heated pool, splash zone and playground. New Conference Center with meeting rooms. Office Hours: 8 a.m. until 8 p.m.